Okay, I know itʼs sacrilege–nothing short of treason–admitting to a dislike of children. But there you have it. I never much cared for them, avoided them like the plague and of course, never wanted any in my life…well, except for one. malnutrition, vitamin deficiencies and highly infectious staph. I couldnʼt even bring myself to think of the ever-short supply of onboard diapers, nor how many times I might have to actually touch one of the little waifs. Compared to the senior San Francisco cabin crew, my feeble Honolulu juniority held no hope of working in first class, nor even the economy galley position. I was stuck working the D and E zones and made a mental note to check my tote bag ASAP for a pair of rubber gloves. 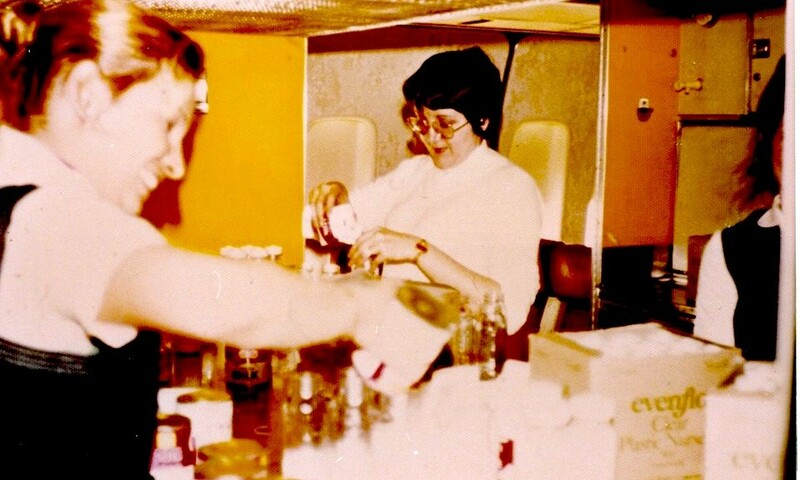 Would anyone take offense to a stewardess donned in pink or yellow rubber gloves? Quite frankly, I didnʼt care, but alas, the hoped-for gloves were woefully absent in my tote bag. Passenger boarding is a blur in my memory of that PA Flight #842 from Guam to San Francisco. In the absence of rubber gloves, I doubt I helped strap the kids into seat belts and Iʼm fairly sure I didnʼt assist with infants, of which there were few. Most of the orphans were toddlers or older. All of them held expressions of confusion and bewilderment, but they were quiet and far better behaved than offspring belonging to my friends. When the captain announced “Flight service, be seated for take-off”, I strapped myself into the aft-facing, single jump seat at R4. As the engines began to roar up to full power and we started lumbering down the runway, I looked for the first time at the little girl facing me. She appeared to be about three years old, but as with most of the Asian orphans, she was probably at least two years older. One eye was half covered in a milky film, the telltale sign of a vitamin A deficiency, but I knew that would correct itself in time with a proper diet provided by her soon-to-be adoptive American parents. Bless adoptive parents, I thought. Who, in their right mind would take on an orphan, especially from war-torn Vietnam? Physical maladies were one thing, but who knew the emotional damage done to these kids? Gaining speed, the Pratt & Whitney engines now sounded like an enraged dragon. I glanced at her again, making sure her seat belt was as tight as it could be, but this time, I saw something else. Something far more noticeable than the milky film. In those young eyes, I clearly saw pure and utter terror. Her arms were now outstretched to me and she was whimpering. Not crying loudly as most terrified children would, but almost inaudibly, as if she did not want to be a bother. I could not begin to imagine what atrocities had occurred in her short life, but there was no time to ponder her village being destroyed, her family being killed or how she became separated from them. She was sobbing now and Pan Am 842 was on liftoff. Immediate action was required. Releasing my seat belt and harness, I quickly unbuckled her, pulled her onto my lap and strapped myself back in. I held her tightly as we lifted into the skies together on jump seat R4. From that moment on and throughout the rest of the ten-hour flight, she literally never left my side. Each time I tried returning her to her seat, she began to weep softly, as if her heart would break. There were no spare adults to comfort her, so with few options, I carried her on one hip or the other during all the drink and meal services. I even took my rest break with her nestled close to me. Somehow, I forgot all about the diseases orphans could carry and even though she probably hadnʼt been bathed in a long time, I could have sworn she emitted the sweet scent of innocence. In a matter of hours, I was hopelessly in love with her. After landing in San Francisco, I volunteered to take her though Immigration and Customs, for which the understaffed Holt personnel were grateful. She was by now as imprinted on me as I was on her. We were quite literally as attached at the hip as any two human beings can be. Before we walked through the U.S. Customs door where her new American parents would presumably be waiting, I kissed her cheek and whispered a promise into her ear. “Mei Lin”, I said. “If your parents arenʼt outside that door, youʼre coming home with me to Hawaii tomorrow.” She clung even tighter, as if she understood. But her new parents, like so many others on that chilly San Francisco morning, were there, waiting in excited anticipation. As the Holt people began matching each orphan with the new parents, a sinking feeling swept over me. Amid the joyful chaos, it was painfully clear, “my” little girl and I were not destined to Hawaii. Suddenly, she was pulled out of my arms into those of her American parents. They looked like nice people, I thought as I stepped back. Maybe they hailed from a small town in the mid-west. Maybe there were bothers and sisters waiting for her at her new home. Maybe she would excel in American schools and become a doctor or the CEO of a major corporation. Or maybe she would take the world by storm, working for an international airline, just as I had. Above all else, I hoped this very special child who had magically–profoundly touched my heart would find a dream and live it. Now feeling very much like an intruder, I softly touched her arm, looked once more into those soulful eyes and walked away. My own eyes were stinging and to my confused amazement, my heart actually physically ached. Who knew this phenomenon was even possible, especially when it came to kids? Then I heard her crying–not softly, as sheʼd cried from her seat on the airplane– but in a full-blown I-wonʼt-stand-for-this tantrum. I didnʼt dare look back. One more pleading look from her and Iʼd have to attempt a kidnapping, or more likely, my heart might actually break. Instead, I dabbed my eyes and smiled. I knew this kid–”my” little girl–would indeed find her dreams and follow them with focused, unrelenting persistence. 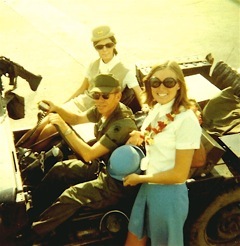 Terese Webber in Vietnam wearing the Pan Am Evan Picone Uniform.